I enjoyed this book so much and think it would be a good choice for a long and lonely stretch of time on a desert island. There are so many memorable characters and different story lines to get stuck into. Reading through David Copperfield’s life and watching him grow is never boring and I don’t think this book will lose it’s charm, even on a desert island. This book for me is the perfect romance! The story jumps through time, as we follow Henry, the time traveller, who is dragged unexpectedly from the present day to a random time, either in the future or in the past. Sometimes he only has minutes and sometimes hours or even days in these other times, with no money, clothes or ways to get back to his life in the present. These travels through time are often intertwined with the love of his life, Clare who first meets him when she is only a child (and he has already shared many memories with her future self). Obviously the book gets quite complicated in places, but it’s wonderfully put together. One thing that would be important on a desert island, is a long, long book. And Gone with the Wind is certainly that. It is an incredible tale of Scarlett O’Hara and her struggle to survive through the destruction and poverty of the American Civil War. She isn’t the most likeable heroine, being selfish, greedy, untrustworthy and willing to do anything to get her own way. However, her sheer determination and courage makes her one of the most famous female characters of all time. I would need this, just to keep me busy. The Italian version of Harry Potter and The Goblet of Fire is long enough and difficult enough for me to take forever to translate! But at least my Italian would be greatly improved! All castaways on Desert Island Discs get to choose a luxury item too, so I would probably have to go for a telephone to keep in contact with the real world, and especially my mum! 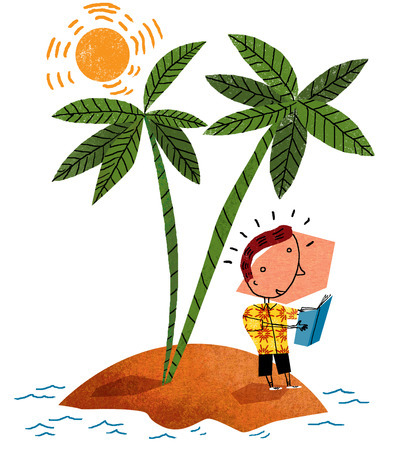 What would be your Desert Island Books of choice? Hm, tough one. Pride and Prejudice, Jane Eyre, The Eyre Affair (Jasper Fforde), At Home (Bill Bryson), and…ooh, Graceling (Kristin Cashore). This is, of course, the list I can think of today — ask me the same question again tomorrow and it would probably be different! Good choices! I was considering Jane Eyre too. Looking back on my list, I think I would probably decide differently now as well!